In infrared light therapy, light photons are applied to the tissue and absorbed by mitochondria in the cells. This increases adenosine triphoshate (ATP) synthesis, which increases DNA and protein synthesis within the cell. The result of this process is faster repair of damaged tissue. 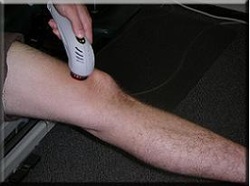 ILT is a very rapid treatment, usually lasting under two minutes. Most patients feel only a slight vibration. It is most effective for carpal tunnel syndrome, TMJ dysfunction, plantar fascitis, tennis and golfer's elbows, arthritic conditions and ligament sprains.